Directly at the forest, near the charming village center, near the beach and dunes. Deluxe breakfast buffet with free self-made lunch and gourmet cuisine with an extensive salad buffet. Lounge with fireplace and intimate bar. Secluded sun terrace. Excellent base for cycling and hiking. 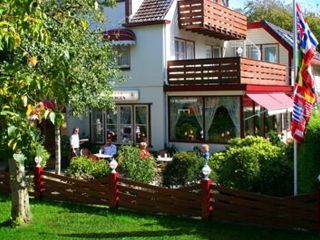 Single room from EUR 42.50 Double room from EUR 45, - per person per night, including ontbijtbuffet.Gratis use of access card for the dunes. Family rooms and villas, on request, children's discount on request. Throughout the year, surprising arrangements!